It can be all work and play in the Rugged Tan 11-inch tall men’s work boot. 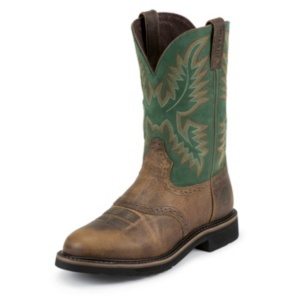 Its cactus green leather upper is embellished by a rustic-themed brown and cream stitch pattern and is paired with a rugged perforated saddle vamp. Though this boot has a vintage feel, it has modern features that contribute to its comfort and functionality such as the J-Flex Flexible Comfort System® insole that adds cushion and support and the Stampede™ rubber and EVA combination outsole with resistance to abrasion, chips, slipping, and marking which allows you to comfortably work on any surface.